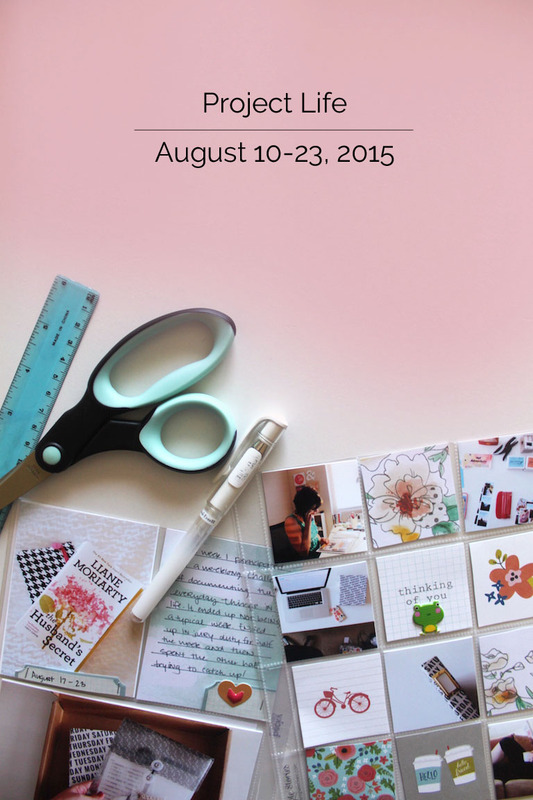 August 10-16: This week happened to be my birthday week! I didn’t actually have anything planned for my birthday, but friends, family, and coworkers made the week really special, and on the weekend I got to spend time with Omar in Carmel. A lot happened and there were many special moment so it was by no means an easy task choosing what photos to include. 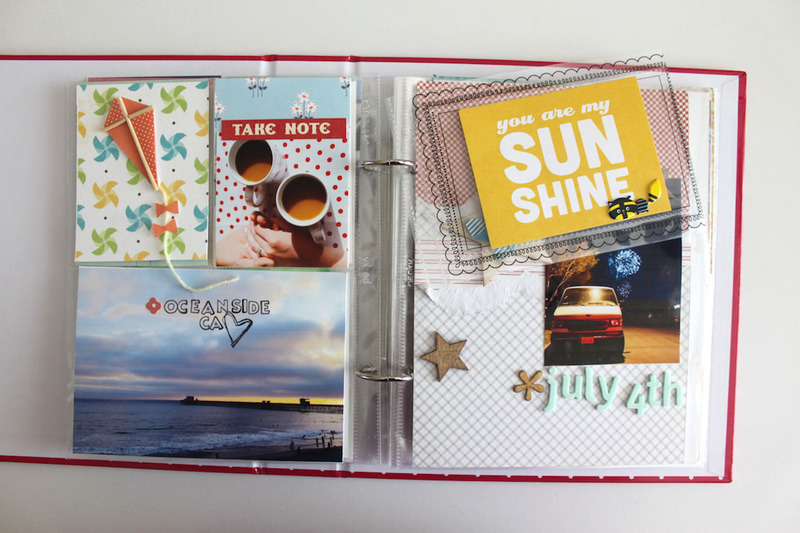 Like most weeks I let the photos be the focal point an kept everything else pretty simple using a few stamps and that journaling card from My Mind’s Eye. 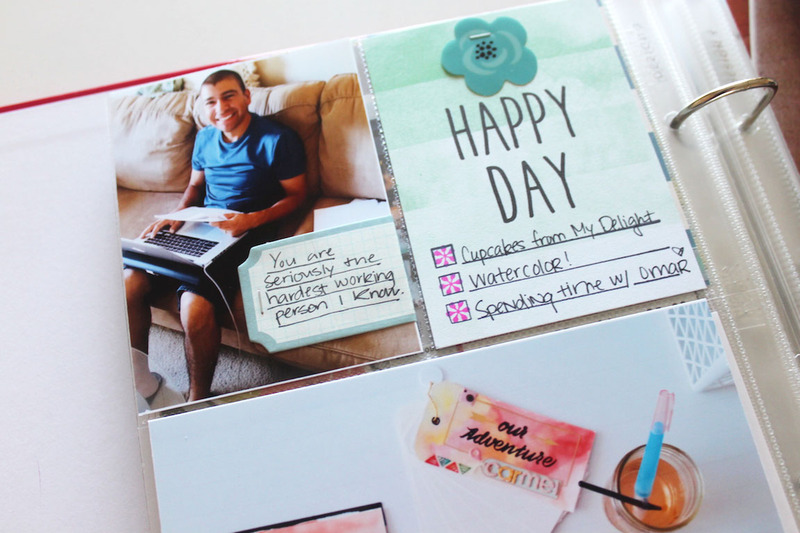 I loved incorporating the birthday cards I received directly into the album. 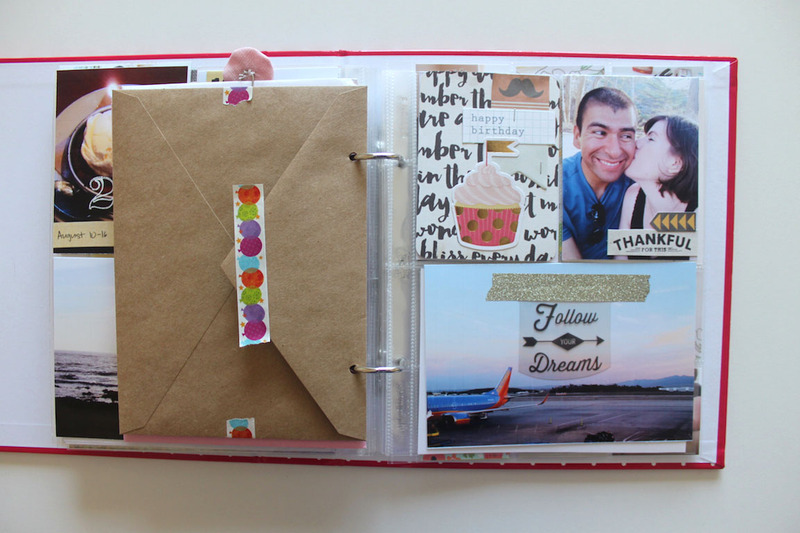 I simply punched holes in each one and stuck them straight into the album. They do add quite a bit of bulk to the album, but that doesn’t bother me. I’m most likely going to get through August with this album and then I’ll have to start on a new one. 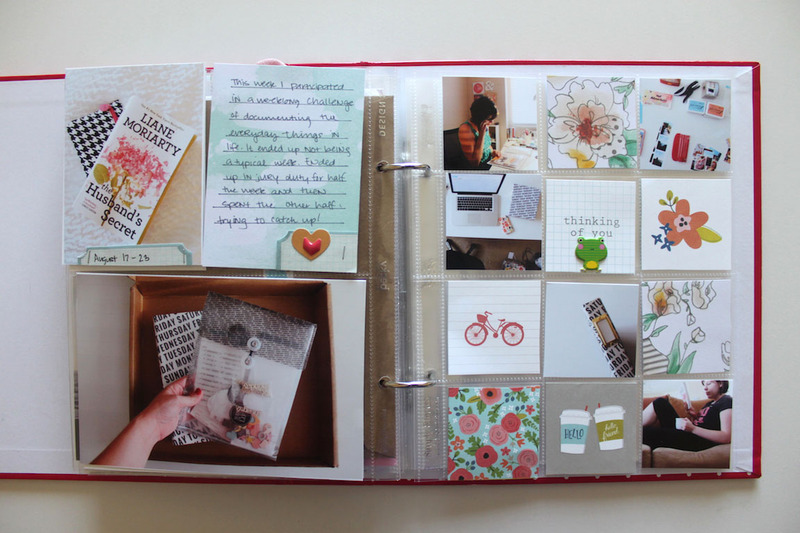 I think fitting 3 months in one 6×8 album has worked out well! 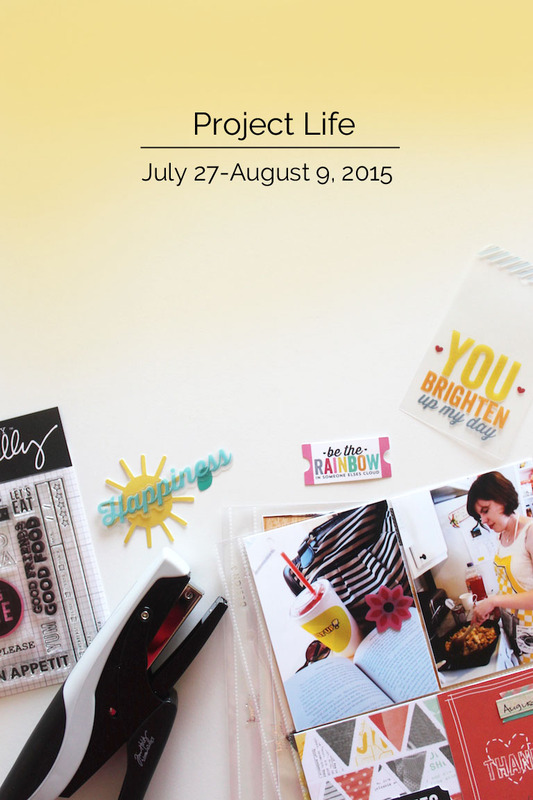 August 17-23: This week I participated in the #weekinthelife documenting project. 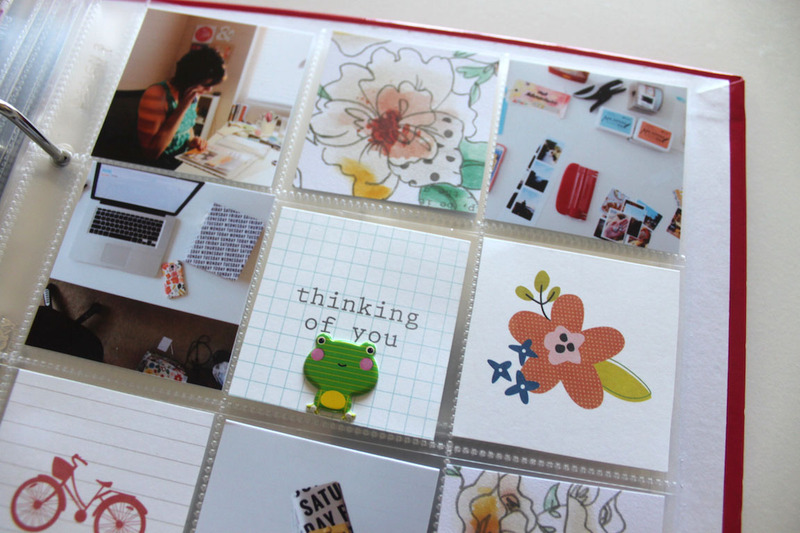 Although I didn’t take a crazy amount of photos I did take quite a few more than I normally do, so I thought this 2×2 grid page would be fun so I could include more photos as well as have some fun with these little 2×2 cards from the Pebbles Happy Day collection. Today I’m going to talk about some photoshop magic. 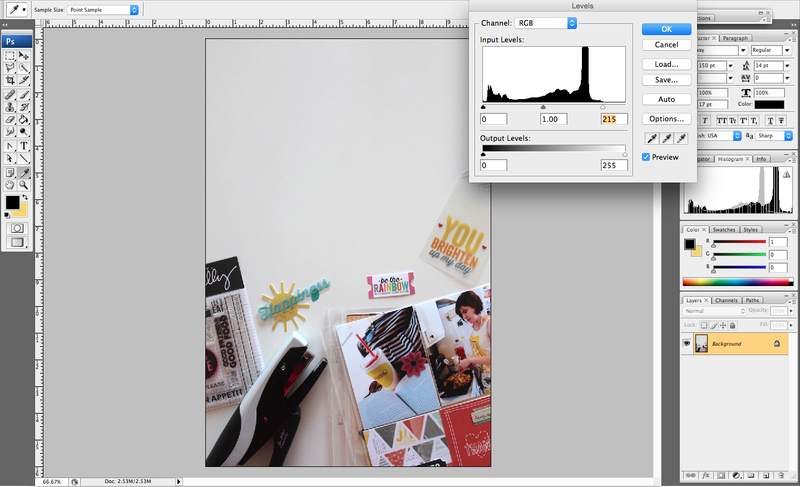 Specifically I’d like to share my current go-to method for making a blog cover photo. 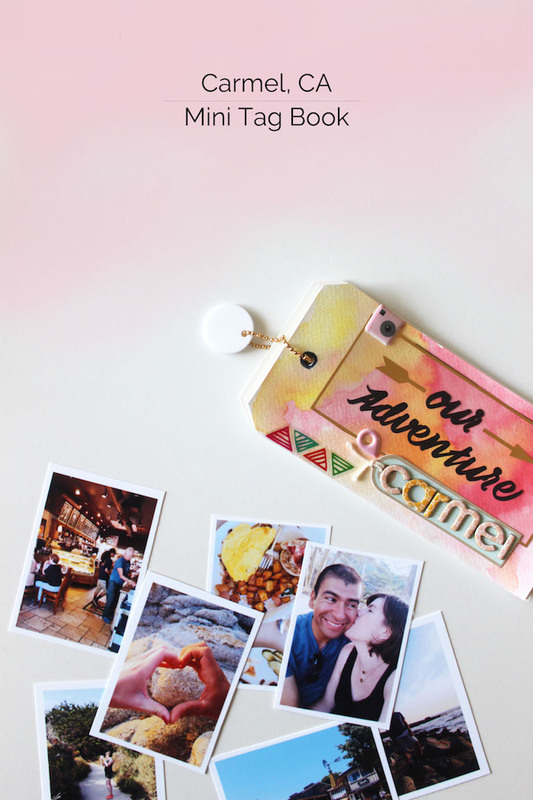 A cover photo is essentially the first image that someone will see in your post and it is also the only photo that someone will see if they are following you on a blog reading server like bloglovin’. That one photo could be the determining factor for someone clicking over to your post or passing on it and it also sets the tone for what’s to come. 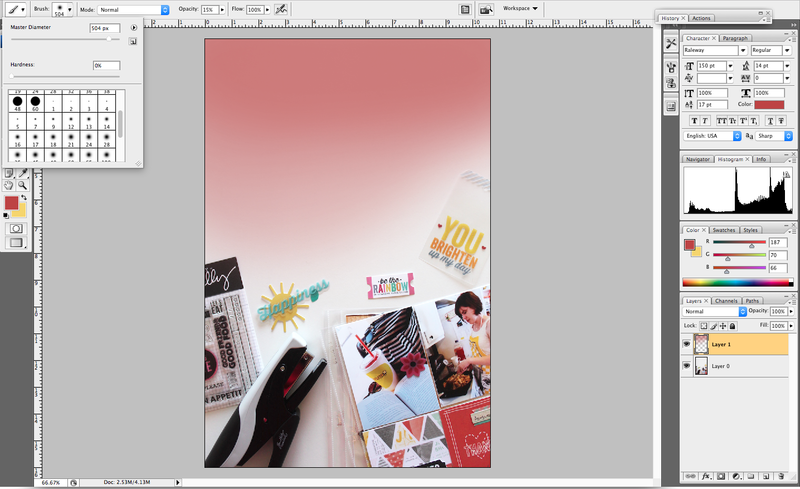 Everyone likes a strong intro, and amazingly with only a few small modifications in photoshop it’s actually really easy! There are so many ways to customize a cover photo so I’d encourage exploring options, but this is currently my favorite method. 1. Curves/Levels: This photo was taken from above looking down at some products on my desk. The lighting was not ideal when the photo was taken and therefore the desk that is actually white has a grey tone to it. To help reduce the grey I like to play with the curves or levels. Simply go up to Image>Adjustments>Levels. I usually only do one thing here- I pull the white triangle on the right under Input Levels until the photo looks brighter and the grey tone has gone down. However, don’t push the triangle too far to the left or you’ll get an overexposed look. 2. Brightness: You might be pretty happy with your photo after you’ve adjusted the levels, but if you like your photo really bright (like me!) then you can also play with the brightness setting. You’ll find the setting under Image>Adjustment>Brightness/Contrast. 3. Add background color: The next thing I like to do is take one color from the photo and incorporate it into the negative space on the top of my photo. Because I leave some blank space at the top of my image for the title I have the option of keeping that space white or adding a little color. Lately I’ve been more inclined to add color. I use my Eyedropper tool and simply hover over a color on the image that I want to use as my paint color. Just click and that color will automatically be set as your next painting color. Next, select your brush tool and then choose a brush that has a soft edge. This is in part what creates a faded look. 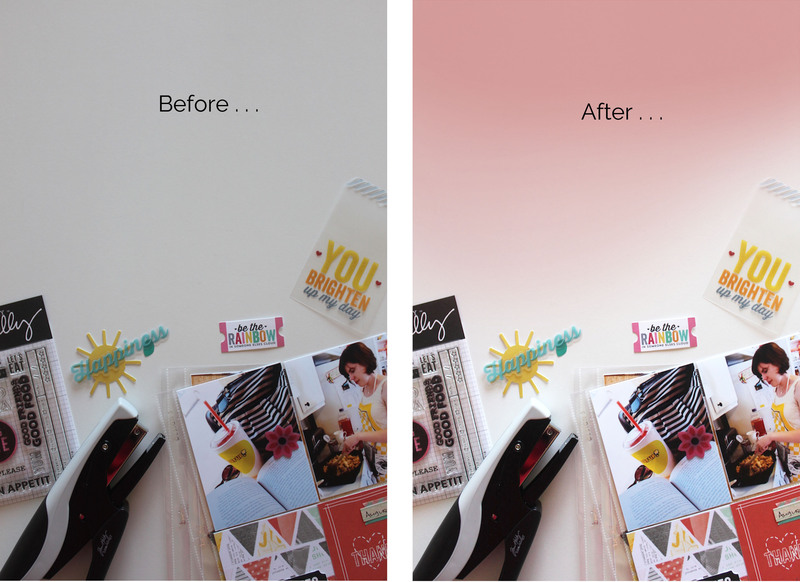 The other aspect of creating a faded look is to lower the opacity on the color. You can go over the image with your brush multiple times to make areas more opaque (like the edges), but some areas can be given a softer color, which will create that ombre effect. So there you have it! Just some easy steps to create a nice first impression for your post. Hope you found this helpful, and if you have other techniques that you use for creating your cover images I’d love to hear them! There’s something about mini books that always gets me so excited. 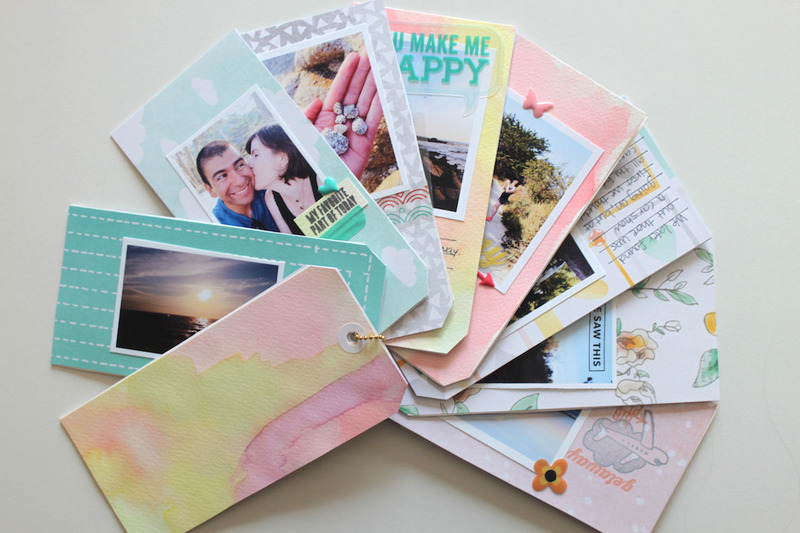 I’m a sucker for anything cute so I think the idea of using colorful papers and fun stamps and embellishments to create a mini project is perfect. 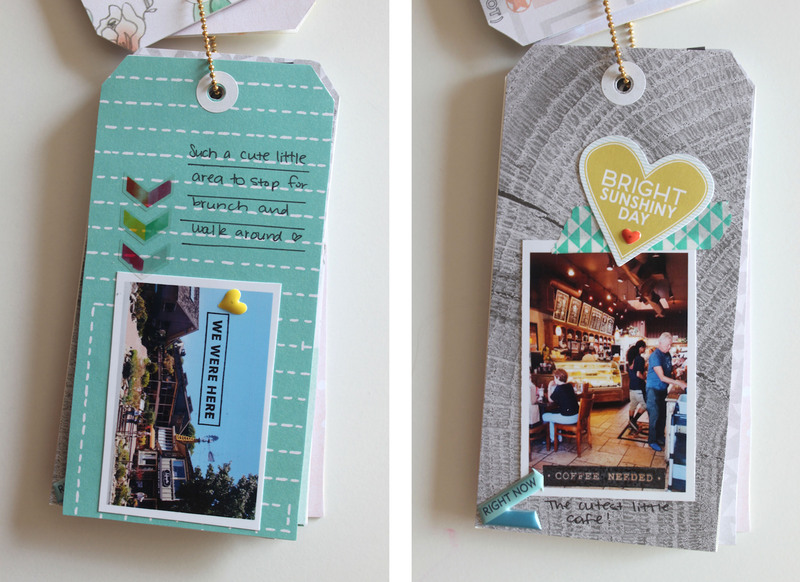 This little tag book came together pretty quickly after all of the photos were printed and I had adhered patterned paper to all of the tags. All of the photos are 2×3 inches so I was able to print them all out on two sheets of 8.5 x 11 inch Costco photo paper. 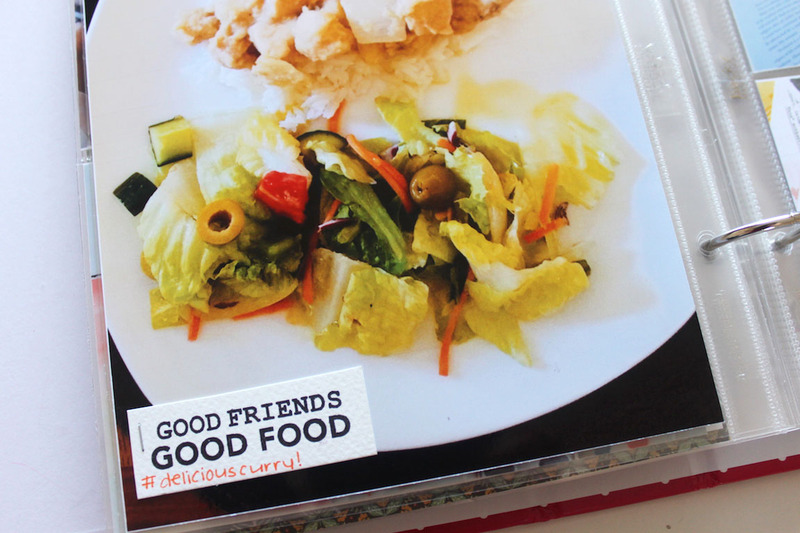 One of my favorite parts of this album ended up being the watercolor tags. I was originally planning to watercolor all of the tags, but after seeing how well the Amy Tangerine stitched collection worked with this color scheme I felt like mixing the two would make things a bit more interesting. This is such a fun way to remember a trip. 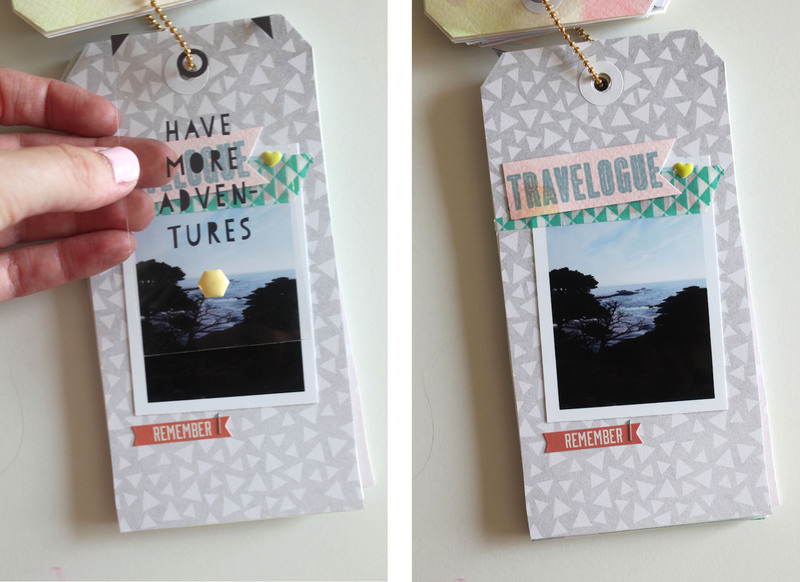 Our one day trip gave me just enough pictures to work with on this tag book, but I could imagine doing a tag book for a longer trip as well- it’s super easy to customize this for any adventure. Other cool stuff . . .
Week in the Life is well underway right now. Although I knew that it was going to be a challenge to photograph little pieces of every day, I don’t think I realized how big of a commitment (both time and energy!) this was going to be! On Monday I took a good amount of photos, but on Tuesday I struggled a bit. Sometimes when you’re rushing through the day, grabbing for the camera to photograph something like eating breakfast doesn’t seem like a priority. However, when the day comes to a close and I’m looking back at my photos I realized the value of slowing down in order to capture the little things. 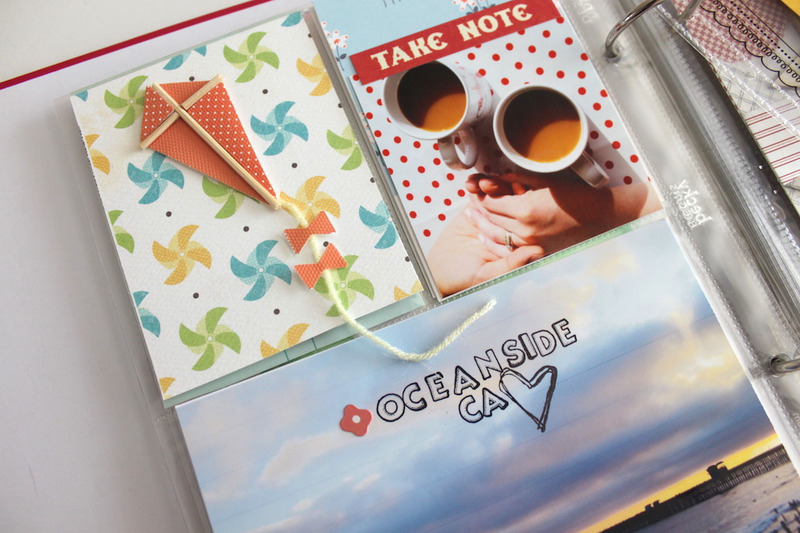 The ordinary and everyday moments are so important to remember, and I know that’s one of the points of this project. Life is forever changing. I know that my life right now looks much different from my life last year and it will look much different a year from now. I know that the photos and journaling I’m capturing now (the little things that I don’t always think about) are things I’ll cherish in the future. 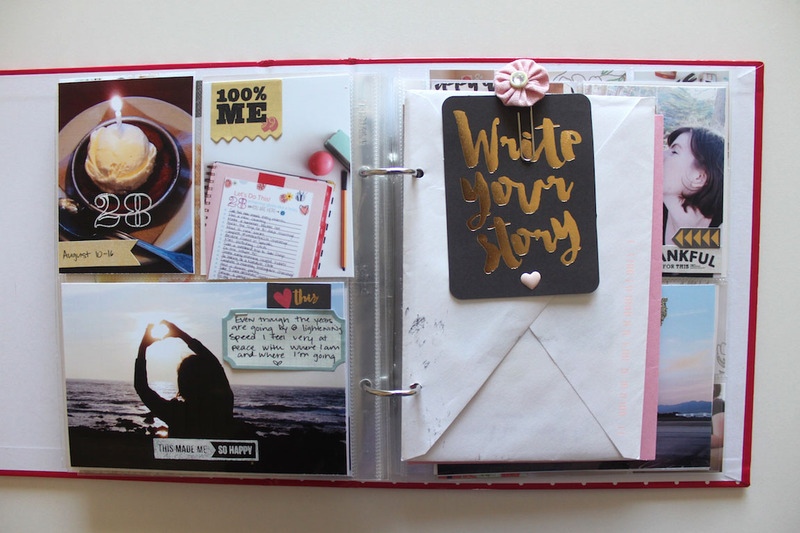 I don’t know how this week is going to come together, but I’ll definitely be sharing my finished journal as well as my final thoughts on the blog in the next couple of weeks. 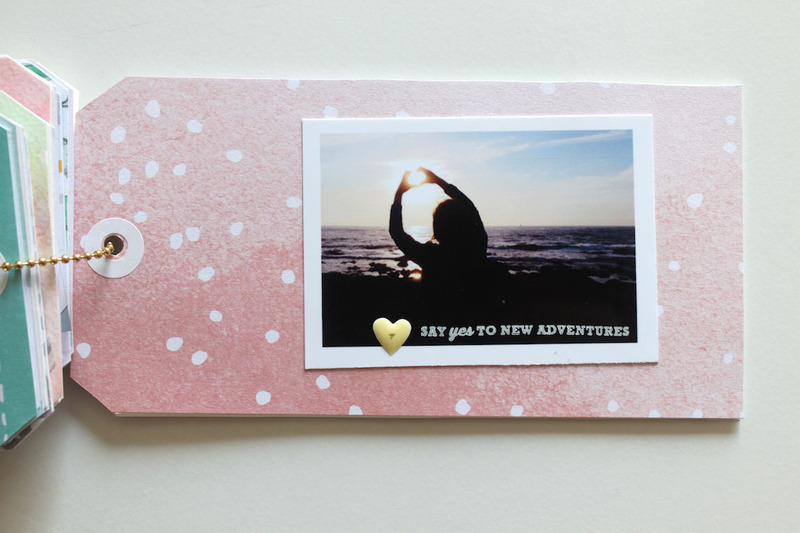 If you’re capturing a week in your life, press on friend. I know this is one of those projects that is going to have so much meaning in the end. P.S. 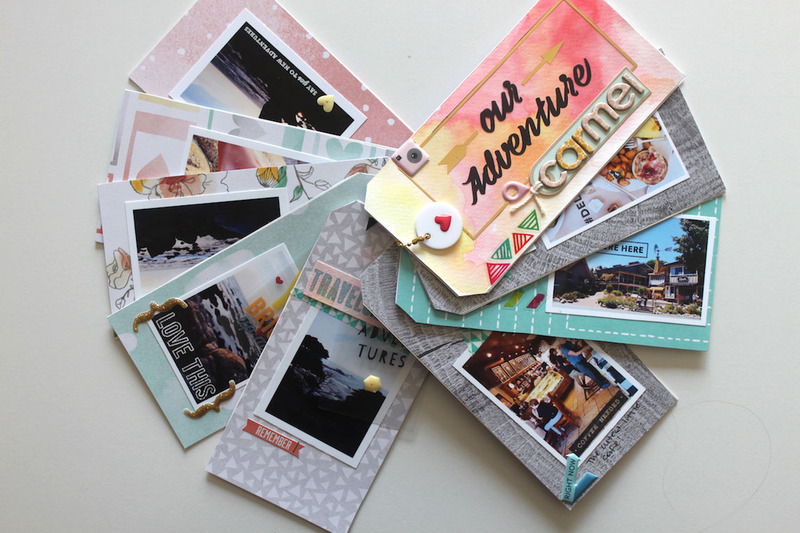 I don’t see the kit photographed above for sale anymore, but you can still find the stamps, cards, and embellishments on Ali Edwards’ site. I fell in love with the Food Coma stamp set by Kelly Purkey this week. These stamps have been around for awhile, but they were new to me and I was super excited to use them. 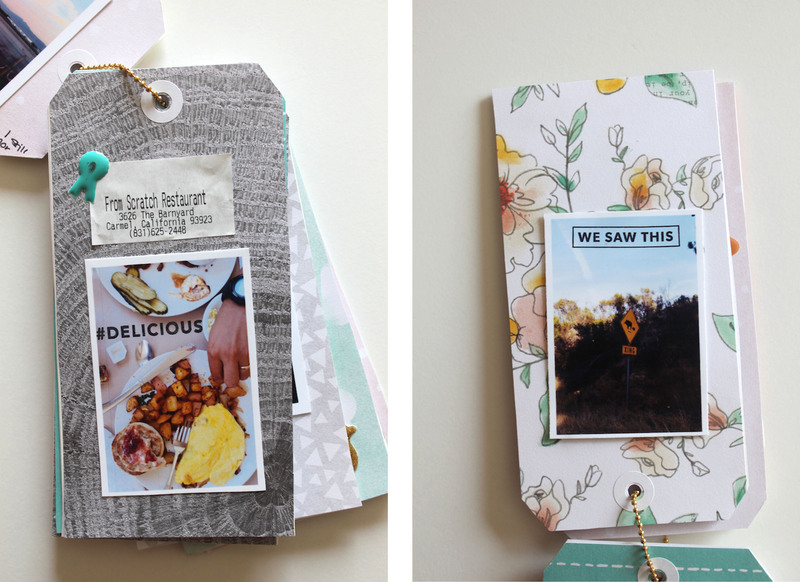 I had to really fight the urge to use every stamp from the set on these two pages, but I did fit in quite a few :-) Lucky for me I actually had quite a few food photos from the last two weeks so I just printed out my favorites and went to town with the stamps. 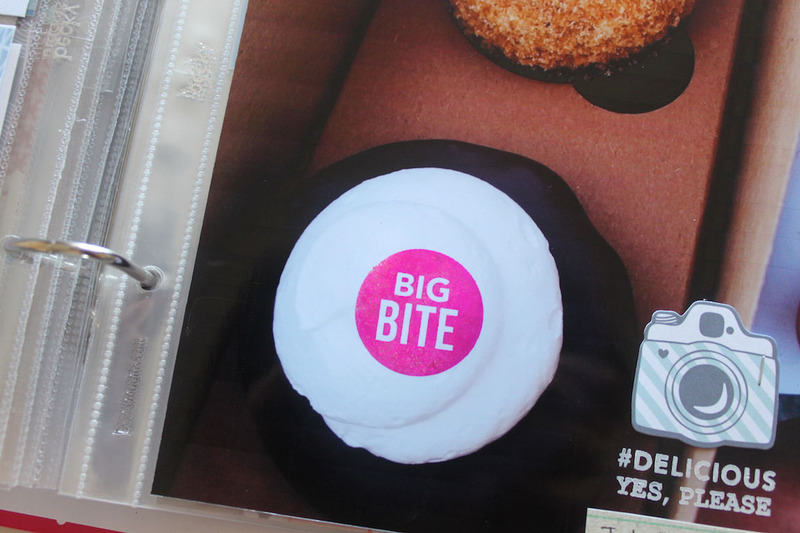 I love the way the neon pink Big Bite stamp turned out on that cupcake. This curry photo was taken from a dinner gathering with the best of friends. I wish I had snapped a group shot of all of us, but I think some added journaling about the night will make this week’s spread feel complete. It’s amazing that after 15 years of friendship this is the first meal that I can remember us preparing fully together, so it’s pretty special. I see many more dinner parties in our future. 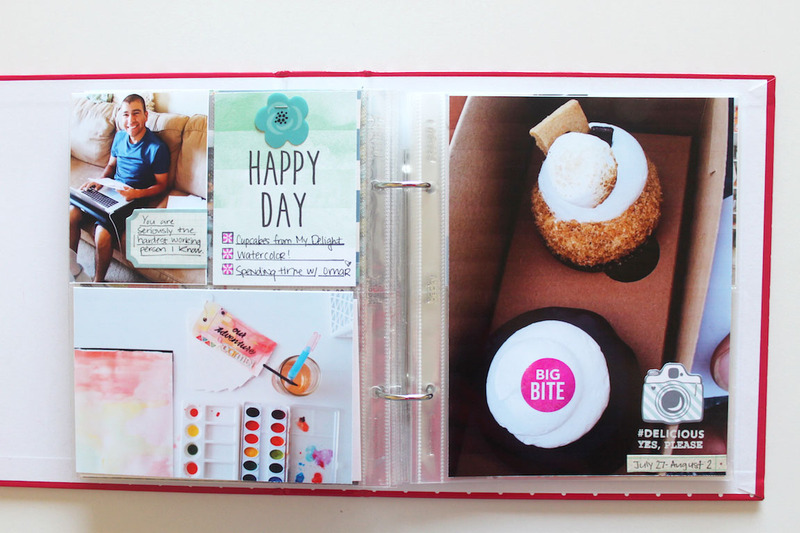 I’m also loving the way that these 6×8 food photos turned out, and by having the giant photos take center stage there really wasn’t a lot of embellishing that needed to be done, which means these spreads came together super quickly. 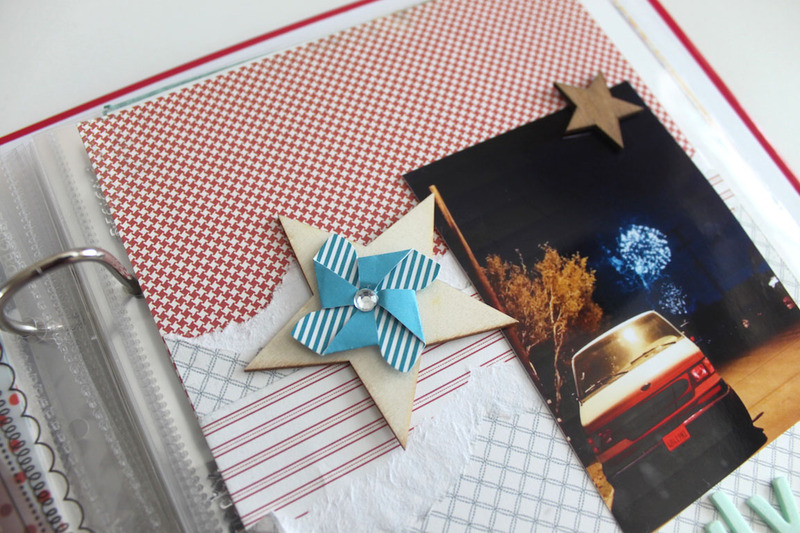 Papers and Embellishments . . . Happy FriYAY! 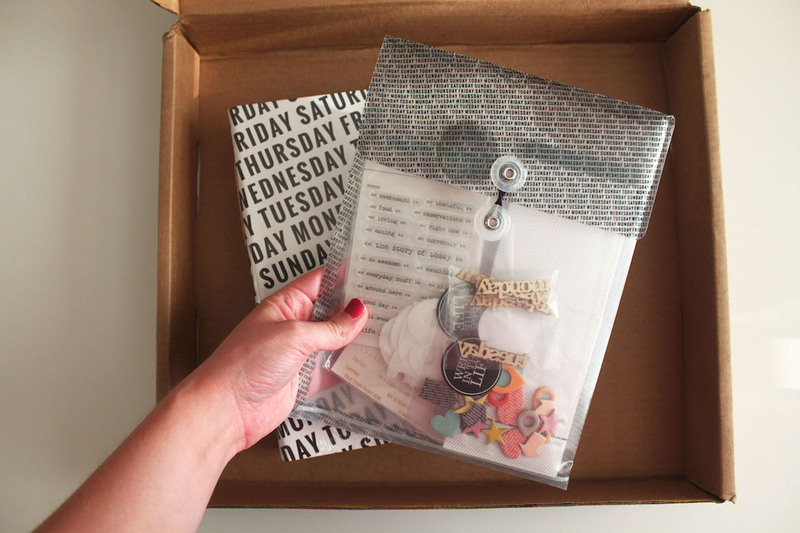 Any day is a little sweeter when there’s a freebie thrown into the mix, am I right? If you’re a goal setter that likes to make lists and cross things off to see progress then I hope you find this helpful. And if you do end up using this template, please tag me in your photo so I can take a look and cheer you on! Happy Friday. Have a beautiful weekend! As I write this blog post it is my birthday, but since this post will go up tomorrow (Wednesday) let me just say so far I’m digging this new year. My sister mentioned to me over the weekend that 28 is the perfect number (mathematically speaking, at least) so at least we’re off to a good start! 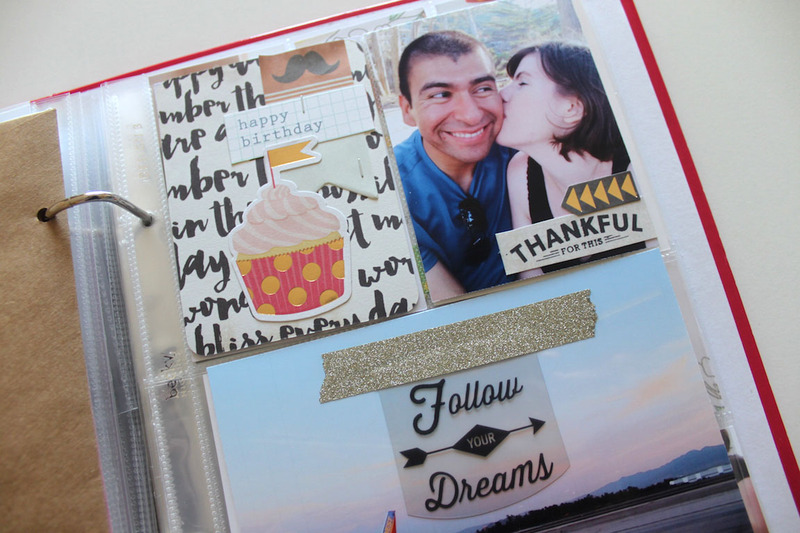 Today I’m really excited to share my new birthday goals for this year. This is now my third year creating this type of goals list and I have to say that every year I love this challenge a little more. Not only do I push myself out of my bubble to complete the goals, but I also learn more about myself and what steps I need to take to achieve the things I really want. 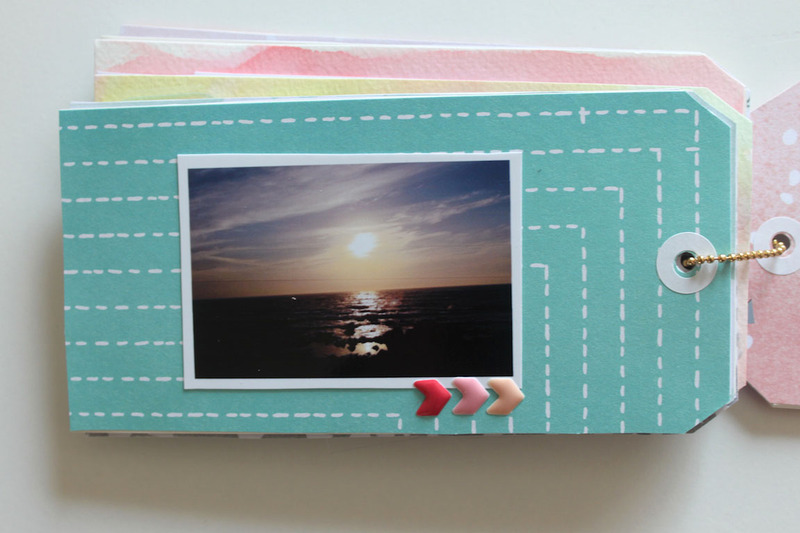 Complete a monthly Instagram challenge. 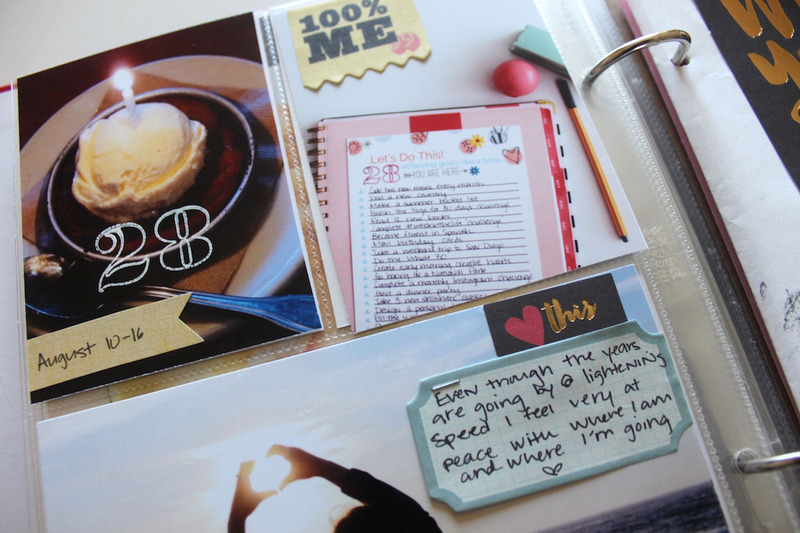 Have you made any goals for yourself this year? How is your progress going? I’d love to hear about it! P.S. If you missed my roundup of 27 goals from last year, I wrote this blog post to recap everything. 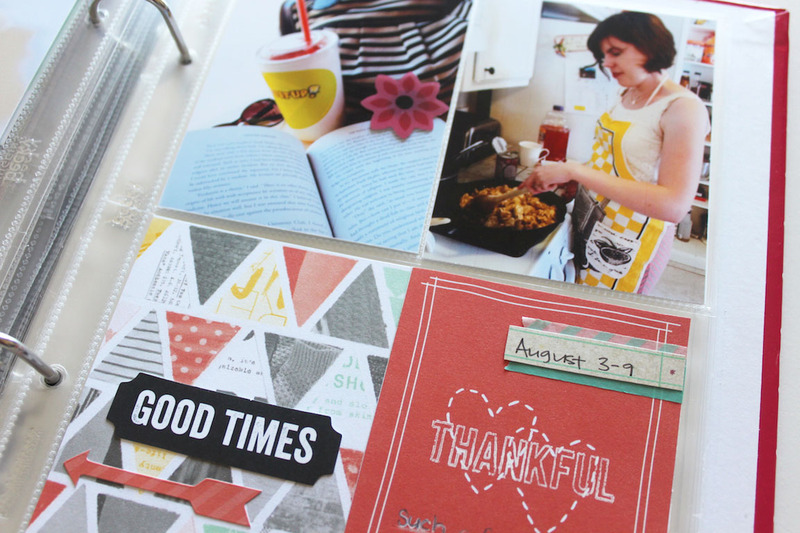 It feels so good to be caught up on my Project Life album! 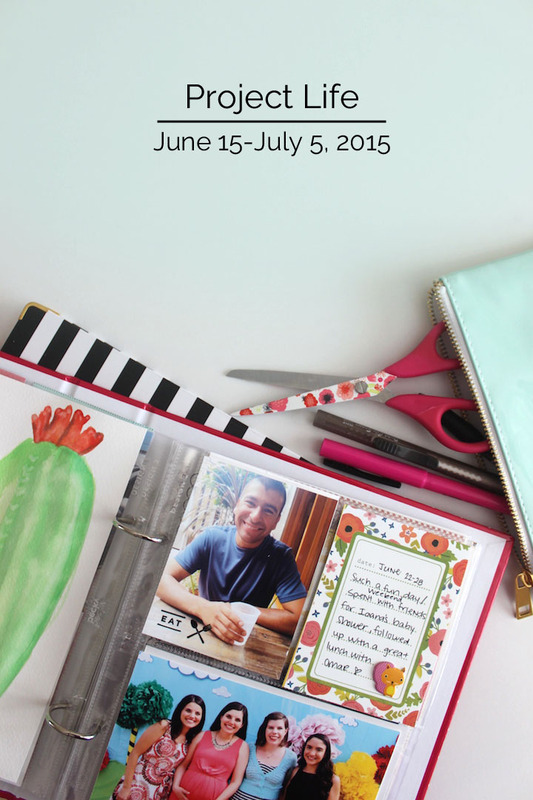 Today I’m sharing my spreads from the mid-June through early July period. Looking back I can’t believe how much happened in this three week period . . . Father’s Day, birthdays, a baby shower, 4th of July. 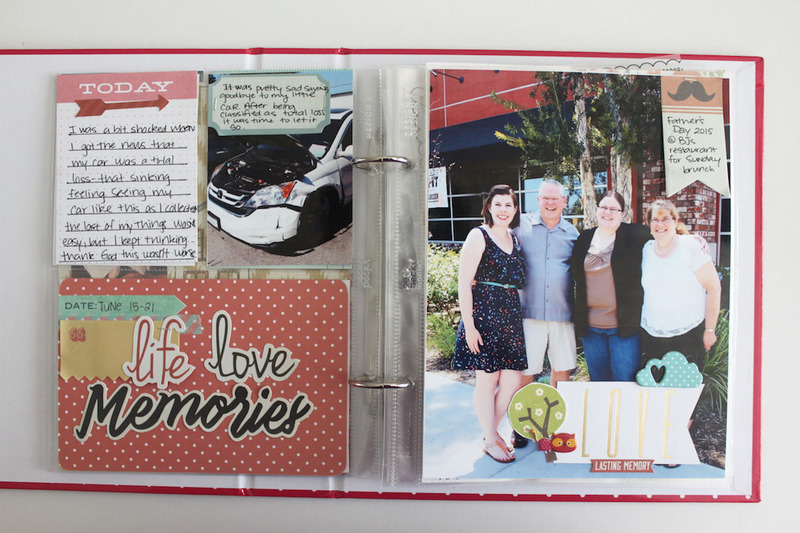 My challenge for these spreads was definitely the task of selecting which photos I wanted to use. 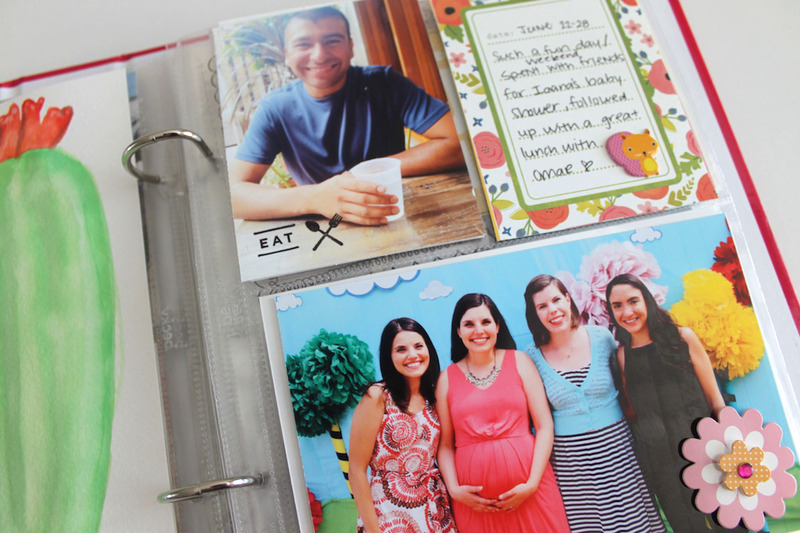 June 22-28: I love how bright and colorful the photo from this special baby shower came out. 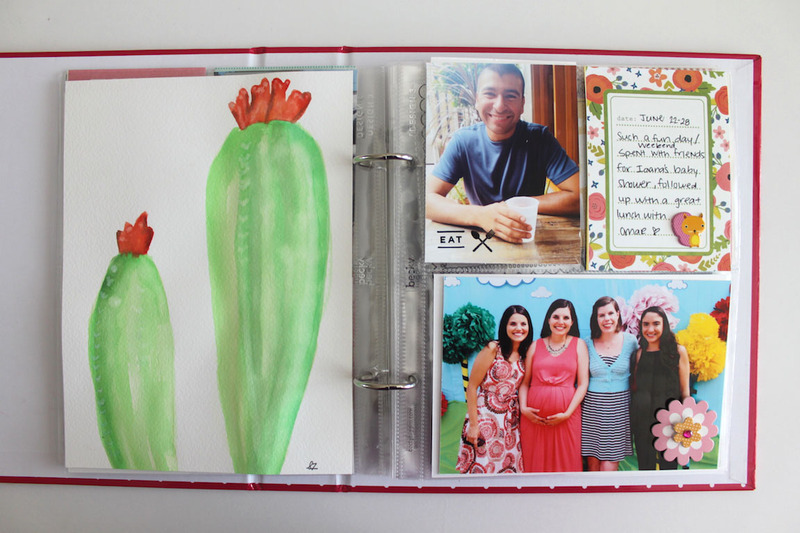 I wanted to stick with the bright colored theme so I tied in a few other colorful embellishments and used a watercolor painting I had completed for the full 6×8 insert. 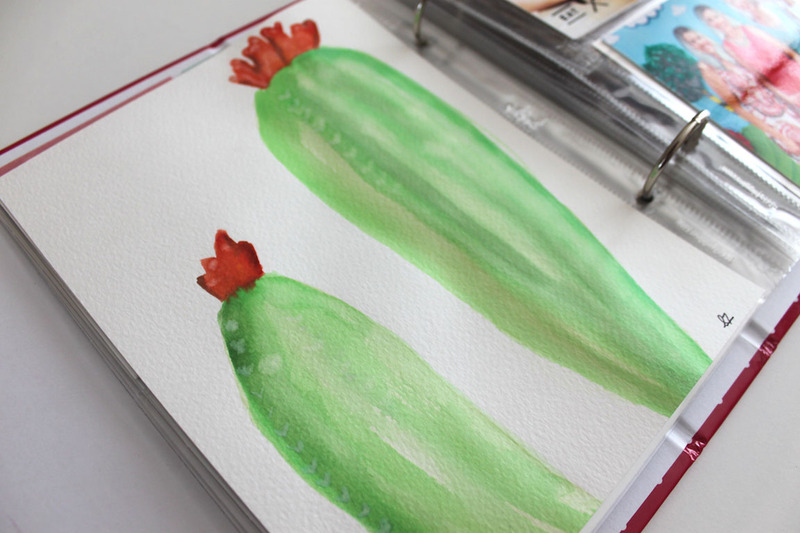 This cacti watercolor was a little practice painting I did one weekend afternoon. Normally I’m not one to hold on to my practice paintings but after seeing how they can be incorporated into other projects I think I might start saving more often. I think these are going to be really fun to look back on years down the road. 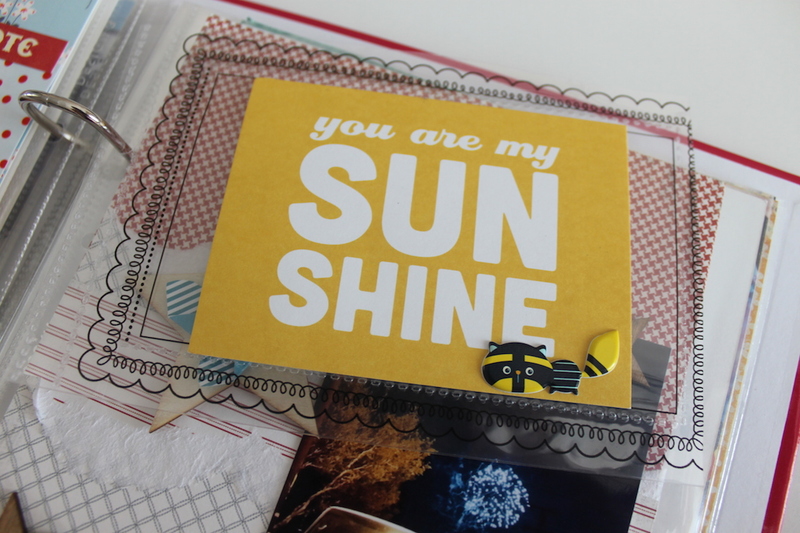 June 29-July 5: I decided to use this little “You are my sunshine” card in its own little pocket protector so that I could use the back of it for my Fourth of July journaling. To be honest, I think the photo used above is slightly creepy (something about the glow of the streetlight and that shady looking van), but check out those fireworks in the background! We had the most comfortable seat for this fireworks show and all we had to do was look beyond the van. 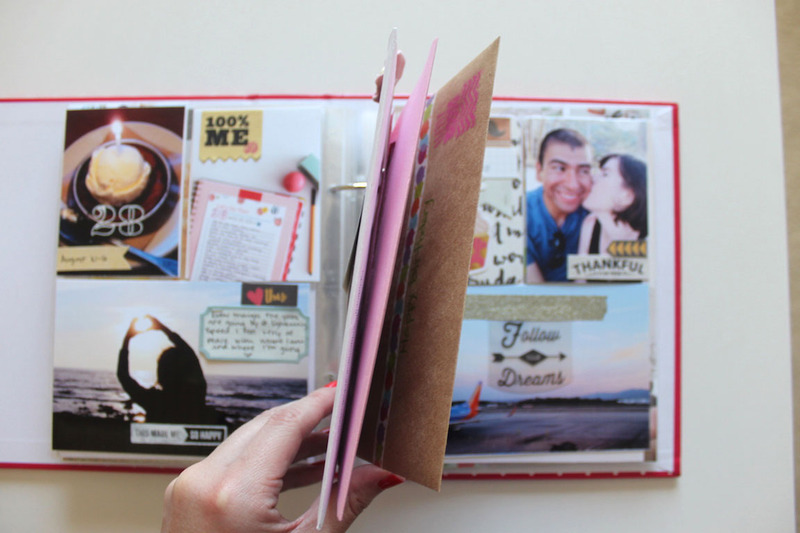 So there you have it, all of this and I’m back on track with my up to date album- hooray! There’s just something about being all caught up is so satisfying, right? Moment of truth! Right before my 27th birthday last year I wrote down and shared 27 goals I wanted to achieve that year. Now that I’m approaching my 28th birthday it’s time for me to take a look at the goals I achieved and the ones I have yet to cross off. Here we go! 2. Visit a new Country: Canada trip Part 1 is here and Part 2 is here. 3. Improve my wardrobe: Yes! 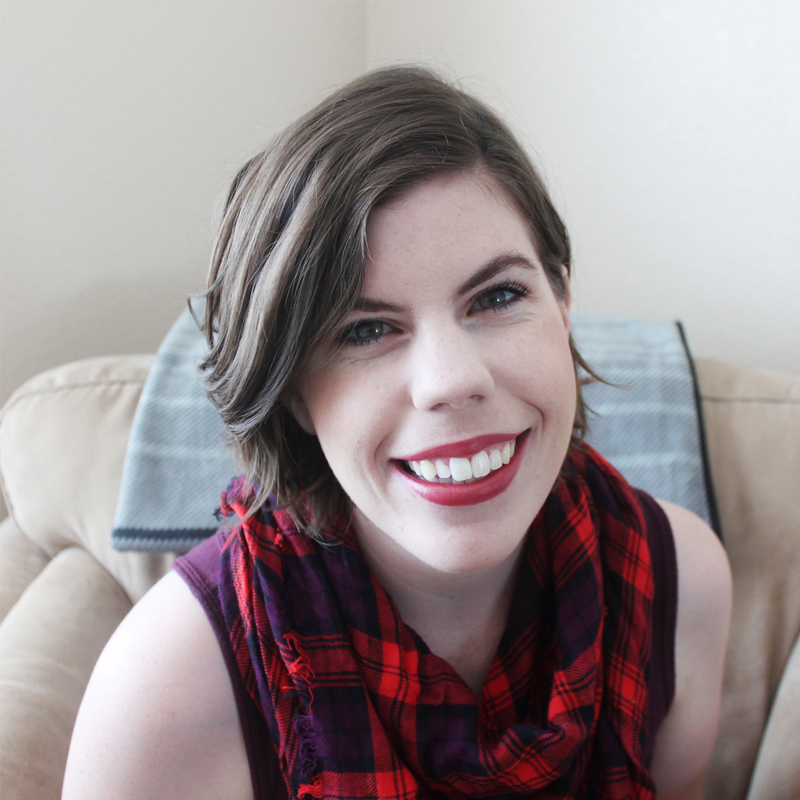 After doing a capsule wardrobe last Fall I purged so many things. I’ve slowly added more clothes that I know I’ll wear again and again, but my closet is much more manageable and feels just right. 4. Simplify the items in my life (embrace minimalism): This is a constant effort. 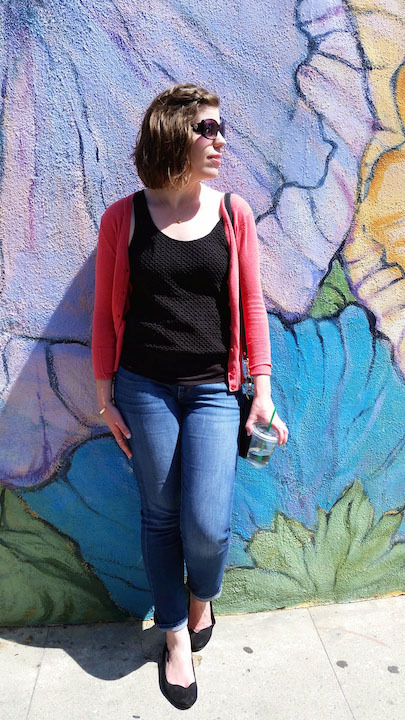 For anyone interested in approaching minimalism, this blog is a fantastic resource. 6. Practice yoga more frequently– It’s still not a regular thing, but I did kick it up a notch this year. Next year I’m planning to do the 30 Day yoga challenge. 25. 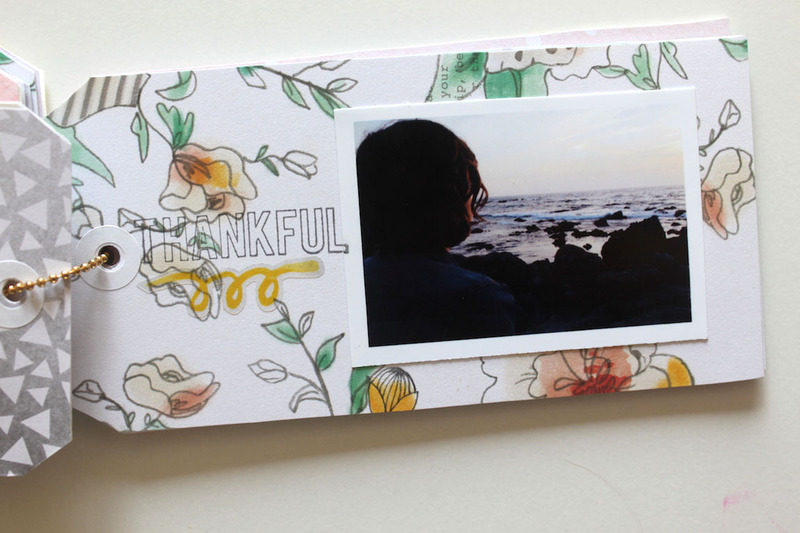 Worry Less: This is really hard to determine, but I really like that I included it on my list. I feel like I’m constantly reminding myself to just take things one at a time and focus on the present. Sometimes I’m successful, and other times are just really tough. I do wish that I had been able to cross off every item- how awesome would that have been?! However, list or no list this has still been such a great year, and I’m convinced that next will be even better! 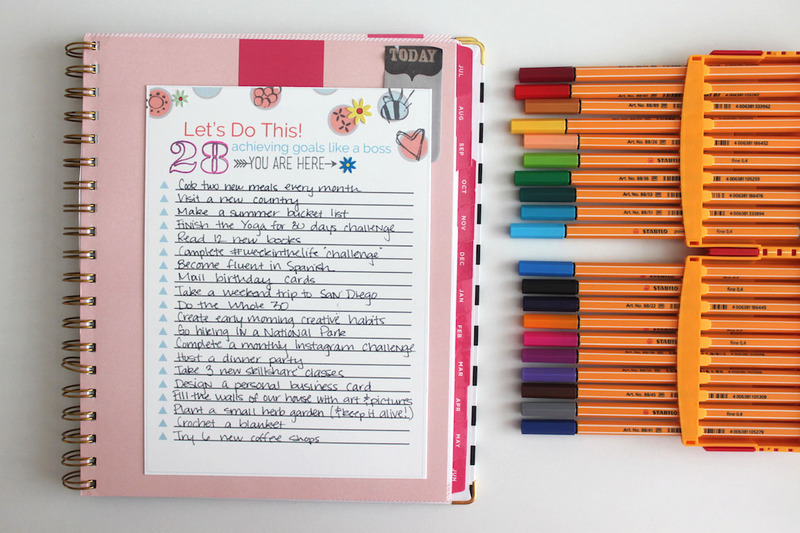 Have you been working on checking off goals? If you have I’d love to hear about it!